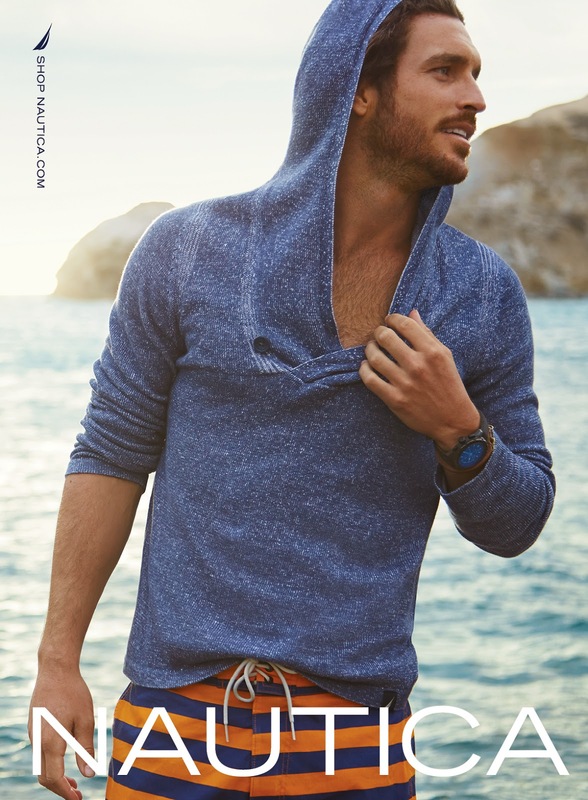 The Nautica® brand announced that models Justice Joslin (represented by Ford Models), Dimphy Janse (represented by NY Models), Ollie Edwards (represented by VNY Models), and Kate Harrison (represented by Ford Models) will be featured in its Sportswear Spring 2015 advertising campaign. This marks the fifth season for Justice, fourth season for Dimphy, and second season for Ollie as the stars of the brand’s campaigns. The campaign features the models boating and relaxing near a scenic, rocky beach, dressed in shades of blue and white, looking perfectly Nautical. Photographed by Matt Albiani on location in Catalina Island, CA and styled by the Nautica Agency with stylist Danny Clurman, the advertising reinterprets the brand in a modern, clean and graphic aesthetic. The campaign features an image of Justice by the water in a cozy knit hoodie paired with brightly striped swim trunks, as well as an image of all four models on a boat wearing white and navy nautical swim suits. Inspired by the horizontal geographic lines of latitude coordinates, the Spring 2015 collections are a mix of stripes, color blocking, floral patterns, and soft, lightweight fabrics. The palette is grounded in Navy and White, with bold pops of color throughout. The campaign will run in select fashion and entertainment publications including Marie Claire, GQ, Men’s Health, Men’s Journal, Men’s Fitness, Maxim, Outside, Esquire, ESPN The Magazine, and Sports Illustrated. The Ads can also be seen in digital. The campaign launches in February 2015. Founded in 1983, Nautica® is a leading global lifestyle brand ranging from men’s, women’s and children’s apparel and accessories to a complete home collection. Nautica® products are refined casual classics inspired and energized by the water that are always crisp, clean and distinct. Today Nautica® is available in more than 75 countries with 265 full price Nautica® branded stores and over 3,000 Nautica branded shop-in-shops worldwide. In 2003, the Company was acquired by VF Corporation, a global leader in branded lifestyle apparel with more than 30 brands, including Wrangler, The North Face, Lee, Vans, Nautica, 7 For All Mankind, Eagle Creek, Eastpak, Ella Moss, JanSport, lucy, Kipling, Majestic, Napapijri, Red Kap, Reef, Riders, Splendid, Smartwool® and Timberland®. For additional information, please go to www.nautica.com and www.vfc.com.